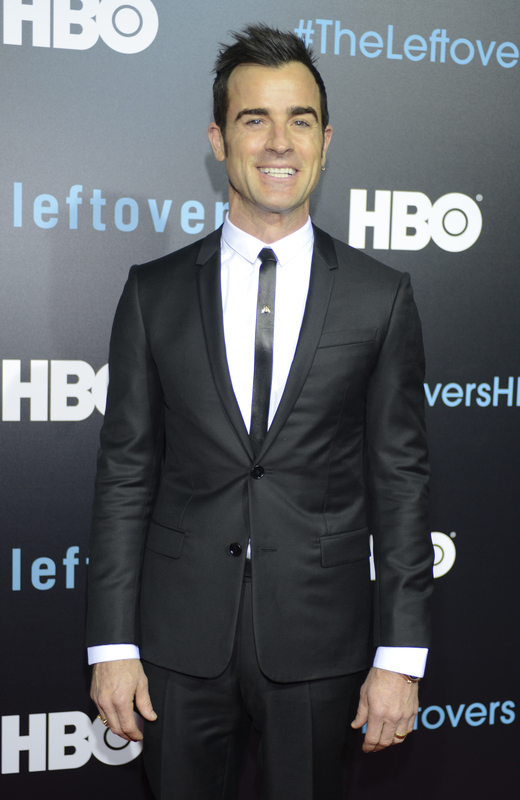 When HBO ended its most recent episode of The Leftovers with its protagonist, Kevin Garvey, lying dead on the floor of a trailer in the woods, the victim of an ill-conceived attempt at exorcising his demons, the show became the latest in a string of high-profile dramas to seemingly off one of its central male protagonists. Not quite four weeks ago, Glenn appeared to die on The Walking Dead , one of the few original characters remaining from the show's first season. And, of course, this past June, audiences everywhere watched while Jon Snow was stabbed in Game Of Thrones Season 5 finale. In an interview with TVLine, Leftovers star Justin Theroux spoke out about his character's apparent death, and whether we can expect him to join the ranks of probably not dead, but also maybe totally dead protagonists. When asked about the scene, the actor revealed, "In the script I remember it saying, 'Kevin is dead — really, really dead.'" But, in the same breath, he acknowledged that showrunner Damon Lindelof "said it’s possible Kevin could come back in some iteration." And, later in the same interview, he teased the next episode, saying: "It’s possible I’m in it in some iteration or form, that’s all I’ll say." So, which is it? Is Kevin "really, really dead" or is he coming back? While The Leftovers has enough compelling characters — including Nora Durst, Matt Jamison, and Erika Murphy — to carry the show without Kevin Garvey's presence, it seems unlikely that Theroux is gone for good, considering his responses in the interview. It's possible that Kevin is coming back as a ghost, just like deceased Guilty Remnant leader Patti came back after her suicide. But, it's just as likely that the show — and its writers and star — are using semantics to disguise a bait-and-switch. Sure, Kevin may be dead now... but that doesn't mean he's going to stay that way. We've already seen miracles in Miracle; Kevin coming back to life wouldn't be the strangest thing we've seen so far on this season of The Leftovers. (That honor still goes to the pregnant cavewoman in the opening scene.) It's not like people being revived after having been declared medically dead is an unheard-of phenomenon. That's the same bit of tomfoolery currently being used on Game Of Thrones. Despite the continued insistence of HBO, showrunners David Benioff & D.B. Weiss, and actor Kit Harington, it's pretty much the world's worst-kept secret that Jon Snow is coming back in Season 6. Sure, the character might technically be "dead" at the end of Season 5, but it certainly won't be long before he's resurrected in a blaze of glory. It's hard not to feel a little bit cheated by such narrative trickery. What has been frustrating fans so much about this recent trend isn't the traumatic loss of well-liked characters, but rather the ambiguity of their demises. TV has never been deadlier, with shows like Lost, Grey's Anatomy, Game Of Thrones and The Walking Dead helping to breed a sense that anyone can die at any time — no matter how seemingly important to the story they might be — by killing off characters left and right. But, now that audiences are used to this trigger-happy television climate, we seem to have moved into the next stage of the phenomenon, in which writers use our expectations of high mortality rates against us to create buzz-worthy cliffhangers. Glenn's "death" on The Walking Dead has been the most egregious example of this, teasing us with the character's fate and then refusing to even address it for the three subsequent episodes, forcing viewers to continue tuning in if they want to find out what really happened. On the other hand, HitFix's Alan Sepinwall praised The Leftovers for not falling into this trap: "An episode that ends with Kevin foaming at the mouth on the floor of Virgil's trailer is a taunt; the episode ending with Michael taking Kevin away is a tease, if the distinction makes sense," he said in his review of the episode. "One is the show messing with us, while the other is the show promising there's more to the story coming up next week." The Walking Dead could learn a valuable lesson from this and other shows. It's OK to tease your audience; nobody actually thinks How To Get Away With Murder is going to kill off its Emmy-winning star, but the fun of the season is finding out how Annalise Keating got that bullet in her gut and who put it there. However, it's not OK to taunt us; don't cheapen your reputation as the deadliest show on television by stringing out the resolution to one of the most potentially devastating deaths in your show's history — especially if that character's going to turn up alive anyway. And, whether Kevin really is dead for good or not, I'm hopeful The Leftovers can stay firmly in the teasing category for the remainder of the season.